Sam came to us upset about his hair loss. He was tired of wearing a hat everyday, and wanted a permanent solution to his baldness. He had a hair transplant 15 years ago at a prominent Toronto Hair Transplant surgeon, however after the first few years the implanted hair started falling out and 15 years later there is little to nothing to show for his $10,00 spent on the unsuccessful transplant. We are glad that we could help Sam acheive the results he was looking for, and its the first session of 3 treatments and already Sam is noticing an amazing improvement. Redness is normal and will disappear within 24 hours. Brent is the HeadPower Technician working on getting natural and realistic results for Sam. Scalp Micropigmentation Training and Business Opportunity. Scalp Tattoo and Hair Tattoo School. The Best SMP Training Course. HeadPower Scalp Micropigmentation Training Course is a profitable add-on for businesses to enable them to provide on-site scalp micropigmentation treatments to men and women suffering from hair loss, and/or scars. Scalp micropigmentation to date has primarily been utilized as a hair loss solution for male pattern baldness, giving patients the illusion of a closely shaven head. However, Scalp micropigmentation can also be effectively used to camouflage scarring, and also enhance hair transplant and FUE procedures by giving the illusion of increased density and camouflaging thinning hair especially for women. The HeadPower Scalp Micropigmentation Training Course is designed specifically for those that want to be able to offer the highest level of Scalp Micropigmentation treatments. HeadPower has a strict global training protocol which adheres to local legislation, ensuring that you will be compliant with your local health department upon graduation. The SMP course consists of theoretical and practical content designed to thoroughly immerse you in the art and science of the treatment. Experts will demonstrate a variety of different Scalp Micropigmentation procedures on clients, including scar revision, density, and baldness treatments. You will also be working on real models while you train to become a scalp micropigmentation professional. You will practice on an average of 2-3 heads per day, gaining real life exposure and hands-on experience. HeadPower Hair Clinic are the world leaders in Scalp Micropigmentation Training, thanks to high levels of hygiene, stringent manufacturing protocols for our needles and pigments, and in-depth thorough scalp micropigmentation training. Our philosophy is to be the best in everything we do. Our products and equipment are of the highest quality and our clinic always exceeds hygiene standards put in place by health regulators. HeadPower SMP trainers are attentive, kind, patient, and passionate about hair loss, and also realize that Scalp micropigmentation is the best hair-loss solution. In fact, most of the trainers have also had the procedure done on themselves and are walking billboards. – HeadPower prices for our Scalp Micropigmentation products and training are very competitive. We also offer finance options if needed. – We have a maximum of 2 trainees per trainer so you get the best possible guidance and attention. – We offer the best post-graduation support available, we are always here to assist you when you’re done training. Personal education and training by expert staff , Wholesale prices for supplies, No monthly licensing fees, No expensive kits required for each client, Live model practice and Education Financing. Do you operate a hair salon, spa, hair transplant center, laser clinic, massage, physiotherapy, or naturopathic business? Its time to add scalp micropigmentation as a new technique to your suite of services. The hair-loss industry has massive potential, and once you’re finished your scalp micropigmentation training program you can begin to serve both men and women suffering from hair-loss. Scalp micropigmentation is gaining steam as the go-to solution for men and women suffering from hair-loss. Scalp Tattoo’s conceal baldness in as little as one session leaving the client looking and feeling 10 years younger. The financial rewards can be lucrative, and with the proper training and marketing your new service has the potential to take off exponentially. There are limited spaces available so if you are interested in becoming a certified scalp micropigmentation professional, you are going to need to contact HeadPower Hair Clinic to reserve your space now. Professionals and average men and women are registering for the program from all around the globe, so the quicker you get started the faster you can cement your place in history by developing your own successful Scalp Micropigmentation business. Contact the HeadPower SMP Training registration department at: 1-888-977-6275 for more information. The increasing popularity of the scalp micro pigmentation has spurred demand for specialists in the field who are trained and certified. Amazing entrepreneurial and employment opportunities can be taken advantage of in the United States of America as well as Canada, UK, Europe and Asia. If you are looking for the best training program to become scalp micro pigmentation professional, it is HeadPower Hair Clinic. What is so Great About Scalp Micropigmentation Anyways? SMP is THE solution for baldness and thinning. Clients who make the decision get the treatment done have already tried the lotions and potions and now realize like most men will, that scalp micropigmentation is the best solution for men faced with baldness. Toupees, hair-systems, and rogaine don’t work. This new hair loss treatment has been made famous by celebrities such as Vin Diesel, and the Joey Lawerence and is now affordable for the average man who is concerned with their hair-loss. How can I take advantage of the new Hair Tattoo Trend? Become the first, or one of the first in your area to provider scalp tattoos to bald men. Make a mark for yourself, and cement your place in history as one of the trailblazers. Being new, its easy to get local press and media coverage. All it takes is one News mention and you could be booked for 6 months in advance. What is the Earnings Potential After Completing HeadPower SMP Training? After taking the Scalp micropigmentation training you’ll be ready to work on clients on your own. You can open your own shop, or add-on to your existing business as a value added service. Men can now walk-in to your new clinic, and walk out the same day with the appearance of a full head of hair. What Existing Businesses would Benefit Most from Adding Scalp Micropigmentation to their existing offering? Laser Clinics, Beauty Salons, Hair Salons, Permanent Make-up Artists, Tattoo Artists, Hair Transplant Clinics, Plastic Surgeons are all great fits. Adding scalp micropigmentation to any of these existing businesses will create a synergistic effect, boosting the bottom lines of both entities. It’s a win-win, and since you already have an existing storefront you don’t even have to pay any extra rent. Your SMP equipment is compact and portable, and can be stored in a closet when not in use. What skills will I learn during the Scalp Micropigmentation Training? Will I train on Real People During My Scalp Pigmentation Course? You will work on real heads for the majority of the program. We make sure that you have the skills and confidence with real people from day one. What skills or Prerequisites are Needed to Take Scalp Micropigmentation Training? There are no prerequisites and People from different walks of life can register to become a scalp micro pigmentation technician. Once you pass the final Examination which is based on theory and practical , you will get your certification which will permit you to operate your smp business. What Equipment will I be using during my SMP Training? You will be provided with your HeadPower Scalp Micropigmentation equipment when you arrive for class on the first day. On day one, you will unbox your new scalp micropigmentation machine and will familiarize yourself with the various components. Its the same machine that you will taking home with you upon successful completion of the scalp micropigmentation training. How Can I find the Best SMP Training? 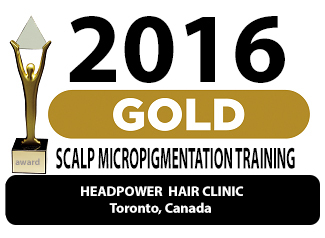 To find the best scalp micro-pigmentation training you’ll need to make the trip up to Toronto, Canada to train at HeadPower Hair Clinic. They are the best smp training provider. How do I Register for the Scalp Micropigmentation Training Program? Who Offers the Most Affordable Scalp Micropigmentation Training? HeadPower Hair Clinic charges Canadian dollars, which gives US and international students a huge cost savings. The 3 day intensive smp training course is packed full of learning and practice on live models, so you’re getting the best value for your money. There are other training programs that train you by practicing on melons which is not sufficient in our opinion. Is Scalp Micropigmention Training Available in Canada? HeadPower Hair Clinic is the only clinic offering Certification in Scalp Micropigmentation. If you’re looking to become a Certified Scalp Micropigmentation Artist, or Hair Tattoo Technician then you should take the training program that’s recognized worldwide. Is Scalp Micropigmention Training Available in the United States? 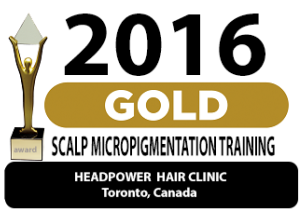 Travel from the USA to Toronto, Canada to take HeadPower Scalp Micropigmentation Training. If you’re in New York, L.A, or Chicago its never been more affordable to learn in Toronto. The exchange rate is in your favor and $1 USD will get you $1.30 CAD. Save on Supplies and equipment, and treatment prices are marked-up in USD for your clients. Can I register for a Scalp Micropigmention Training in Europe, Asia or the UK? HeadPower Scalp Micropigmentation Training Certification is recognized in Europe, Asia and the UK. Fly to Toronto for the 3 day intensive training program, and go back to your hometown with the expertise and skills to be helping people suffering from hair loss from day one. Hair-loss is a multi-million dollar industry internationally.